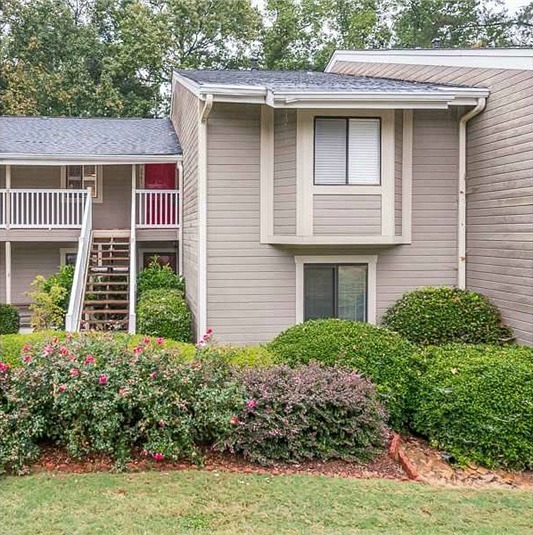 When a reader named Gaynell showed me how she updated and decorated her mid-1970s two-bedroom condo in Marietta, Georgia, I was wowed. She says they spent two years working on it: “We did all the work ourselves, with the exception of the plumbing.” Take a look! When Dave and I were first married we rented a two-bedroom apartment similar to this one. Even the exterior looks like our old place, so it brings back memories. The interiors are another matter, however. I wish ours had looked like this! They put over $30,000 into fixing it up for their family. The built-in bookshelves provide some additional storage space. 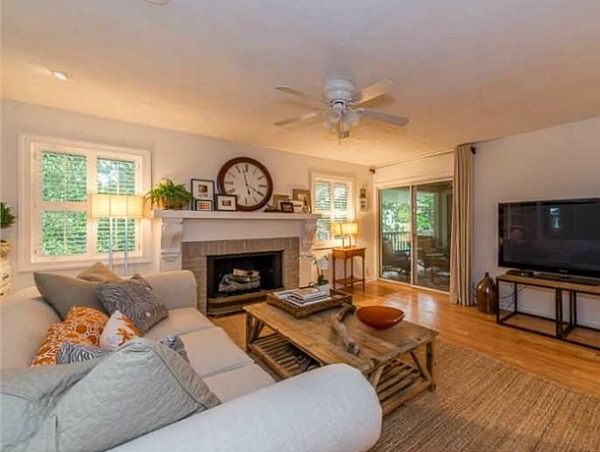 They updated the fireplace and installed hardwood floors throughout. A balcony connects to the living room and master bedroom. The unit has about 1,200 square feet with 2 bedrooms and 2 baths. Thanks, Gaynell! The asking price is $100,000, which sounds like a bargain to me. Check the listing for all the photos and information! 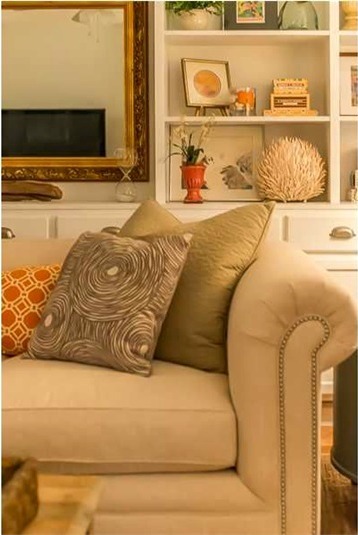 Oh my gosh, I love everything about her decorating style. 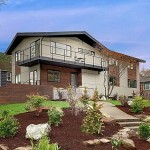 In my part of the country (Seattle) this would be 350-375k! Someone is getting one heck of a deal when they buy this place!! Loved this one! I can’t believe you can get a place with a kitchen like THAT for only $100,000. I love the bookshelf in the kitchen, and the industrial storage in the corner, that is oh-so-cool and not-trying-too-hard. Beautiful! Thanks Kelly, Prices are crazy low in the south! Can you believe the kitchen cabinet is a hutch top we found on Craigslist for $25.00? And the cart we had made, it’s a knock off of Anthropology! That’s an IKEA sink and probably the butcher block too. 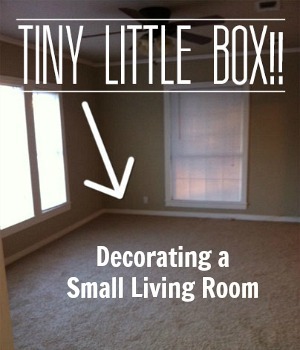 Great condo ! This is very cool. I wouldn’t live in a condo, I don’t think, unless I know for sure I wouldn’t hear noise from next door, but this is nice. I love the kitchen and the shelves. Congrats on a job well done. 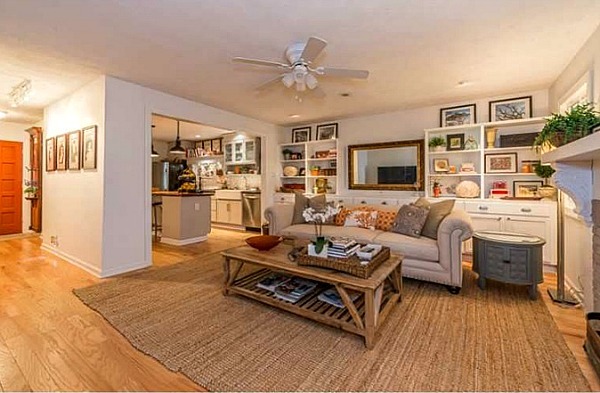 This condo is so well laid out & just filled with excellent details that bring out its charm. I absolutely adore the kitchen with the view of the living room fireplace nearby. 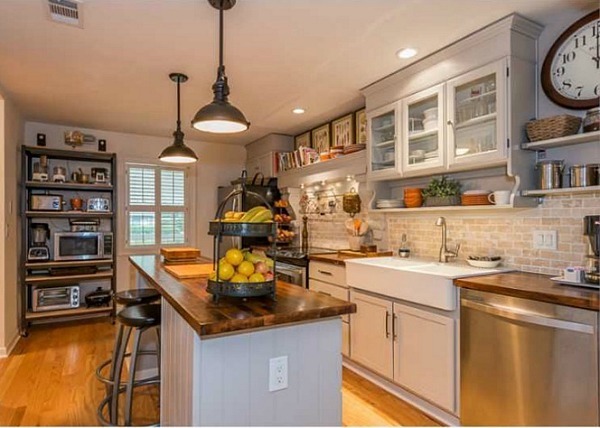 The open shelves, farmhouse sink, wood topped island add a lovely homey touch along with the wood floors. 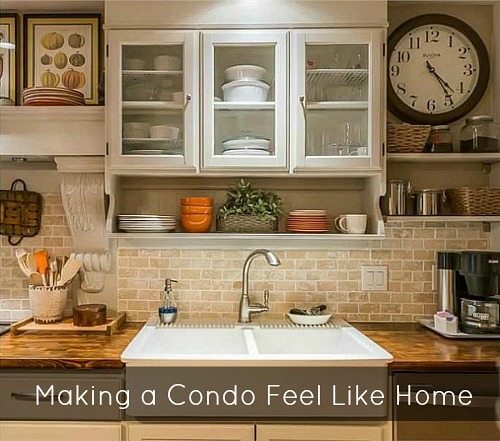 Condo living is very appealing in many ways & this one is definitely a winner. This is absolutely stunning! I love the large corbels they used throughout the kitchen and in the fireplace surround. Beautiful!! Wow! What a well done renovation! That is adorable. What an amazing makeover. Hi Julia we lived in a flat (thats what they call them here) only they don’t look anything like this. It looks like this couple have the Midas touch. I think if this property was here you would be looking at about 300,000+. It’s beautiful thank you for sharing. Regards Esther from Sydney. Is that a down-draft range, or some kind of cool hood/shelf situation happening? 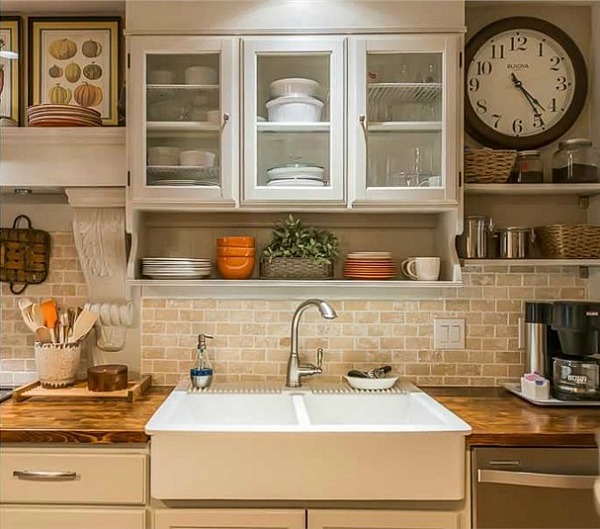 Would love to know more details like where she got the cabinets, counters, light fixtures, etc. 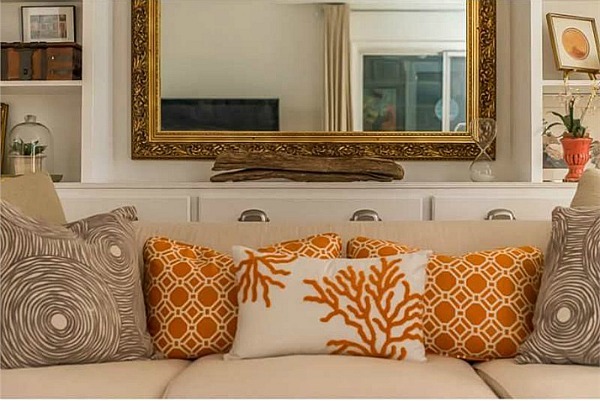 Love the pops of orange in both rooms – gorgeous! Thanks Katie! No downdraft in the kitchen, we have installed them in the past and never used them, so we did a mantel in the kitchen to mimic the one in the living room, Believe it or not the glass cabinet over the sink is a hutch top we found on Craigslist for $25.00. The cabinets are stock from Home Depot, The lights are Lowes. The countertops are IKEA, sanded with four coats of stain and two coats poly. Rack was knock-off from Anthropology we had made. Stools were from Storehouse. And orange is my fav color, in small doses of course! 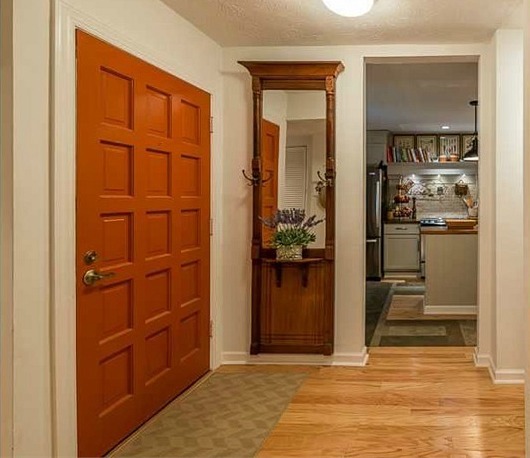 Is there by chance a pantry cabinet out of view on the other side of the kitchen? Where do you store food? Hi Maria, There are two pantries built in behind sliding doors that are directly behind the barstools. no wasted space here. There is also a large walk in closet the length of the hallway as well. Plenty of room for a condo which was the appeal when we were buying. 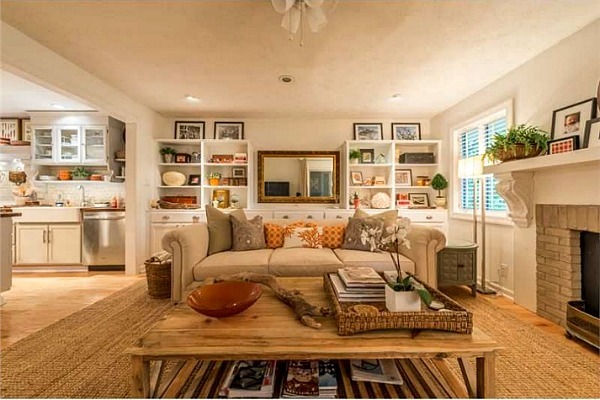 This does not even look like a condo, but the interior of a home…. it was very well done, and the kitchen fantastic… I love the bookshelf! I would be afraid the books would get greasy at some point though, so maybe not too practical, the same reason I don’t like exposed dishes in a kitchen. It’s very attractive, but I don’t see a dining table anywhere. Where do they eat? The island only has 2 stools. Yes, I was wondering the same thing myself. It’s really pretty, but I’d need to add a dining table, and a couple of chairs in the living room. Otherwise I could move right in! If they’re anything like us, they eat on the sofa while watching TV and checking email! haha! Joan, some of the furniture was taken out for the pics, a small table and four small chairs sit right under the window, right of the fireplace in front of the sliding glass doors. Also, we had two club chairs. You can’t really tell from the pics but this room is huge! Her style is wonderful, beautiful! Beautiful. 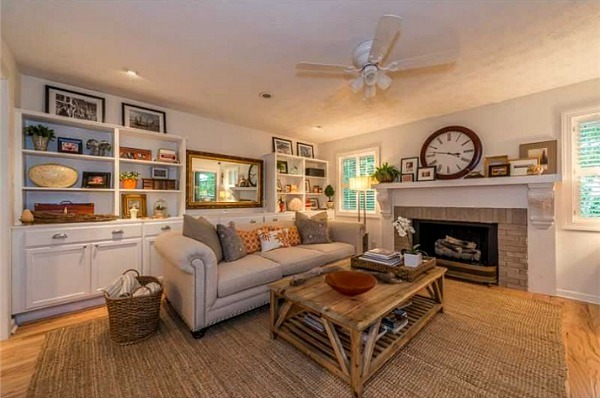 Is there anyway to ask the homeowner where she got the couch in the family room? Did she get it here in Atlanta? Maybe she’ll stop by and answer some of your questions! I have been looking for a new sofa in Columbus, OH and I ran across this exact sofa this past weekend at Kittles. Thanks Coleen, The sofa came from Mitchell Gold in Buckhead.. .it’s the Black Label Collection. It is exactly what I am looking for…so sad. Okay, I’ll let her know! What a beauty! I love every single thing about it. I hope they get a lot more than $100,000 for it! Wow. Very nice job. I love the island in the kitchen. The size of it fits perfectly, plus the wood for the countertop just looks great. I love it…she is a wonderful decorator—everything about it is just beautiful. My two favorites in a kitchen, subway tile and butcher block counters! This kitchen will never look dated! Wow, spectacular! Sure wished I lived close, and was in the market for a condo. I really like the back splash and lights in the kitchen. Great remodel! What a lovely home! Having just sold a condo for my father, I wish them good luck. wow! simply stunning! doesn’t even look like a condo! Stunning for sure, in every way shape and form. I especially love the patina of the kitchen countertops. My only hesitation is putting so much money into a 1970s condo development. For the heck of it I Googled the street and other condos that are for sale or have sold on that street are in the $50-55k territory. While I wish them well, as a buyer, I would not want to be the most expensive unit in the development. One wonders what $100k gets in Marietta for a single family home and what shoppers out there are looking for in that range. Don’t misunderstand me, I think what they did was fabulous but every renovator has to contemplate over-renovating for the neighborhood. I wish them a speedy sale so they can tell me I don’t know what I’m talking about. 65andcounting, There were a couple sales at that price that were foreclosures and original, however, the most recent sales on remolded units are in the high 90’s-100s. We were under contract within a few days, We had two offers, we close on Nov 25th. And my agent told me today another agent has written up a backup offer they will be sending over. Keeping my fingers crossed. Will keep you posted. YEA!!! What fabulous news. Lucky new homeowner. One word – STUNNING! 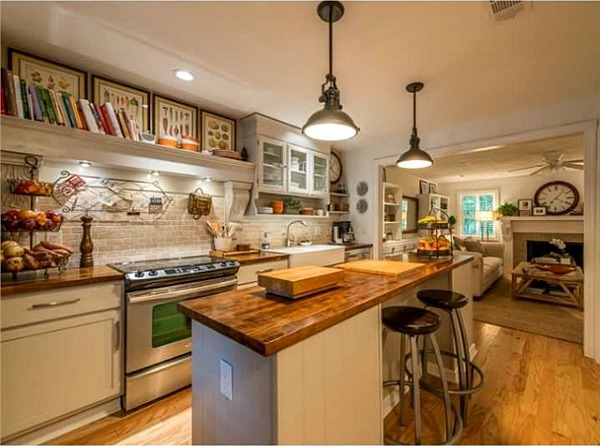 I’m drooling with envy over those gorgeous counters in the kitchen. Everything in this condo is beautiful. While it’s elegant and timeless, it’s also warm and welcoming. I love the updates but don’t see a dining space outside of the island? Hopefully it is tucked away somewhere since that lovely kitchen calls for some wonderful cooking. LargeEventPlanner, some of the furniture was taken out for the pics, a small table and four small chairs sit right under the window, right of the fireplace in front of the sliding glass doors. We love to cook and having remodeled several kitchens we only put in what we use. We try and keep it totally functional with a little sass thrown in! The whole place looks amazing! 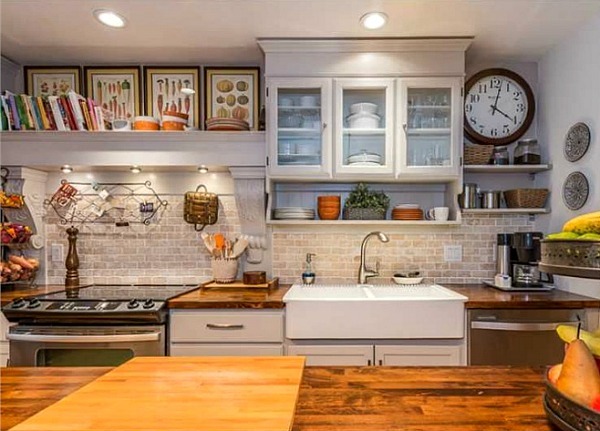 I am about to re-do my kitchen and am interested in using IKEA butcher block counter tops. Are you pleased with them? Love the whole thing. Hope you will share your next project! Thanks Sara. Love our countertops, well worth the money! This is just beautiful and the best part is that they did it themselves. 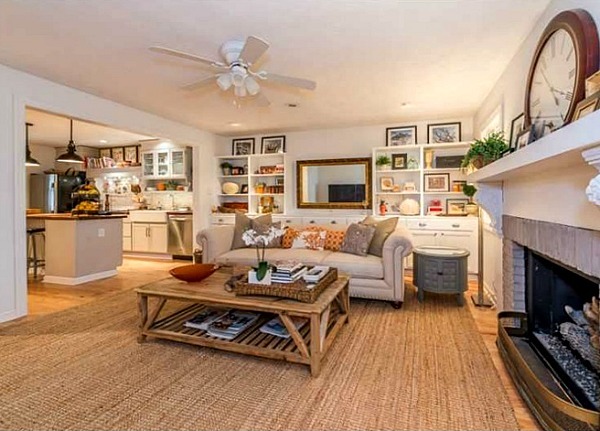 Imagine the lucky people who will purchase this beautiful condo! AND the price, wow. Amazing! No surprise that it sold so fast. I hope you have fun decorating your bungalow, Gaynelle. It just goes to show you can have great style and function in a smaller size. We see so many ginormas homes go up and they don’t seem to build much character into them. This is true gem. Thank you so much for sharing and congrats on the quick sale. Beautiful job! I am not sure if this has been answered or talked about above, but if you would not mind sharing: where is the kitchen backsplash from? Valerie J, Thanks! I’m pretty sure the tile came from Lowes, if not Home Depot. Thank you for the reply! You did a fantastic job! I love what you have done with the place. It looks great.